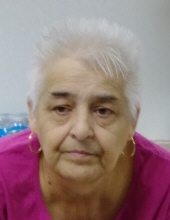 Linda E. Holmes, 71 of Bourbon, IN, passed away at 12:18 pm, November 16, 2018 at home with her family at her side. Survivors include her daughter Tammra (Eric) Johnson of Bourbon; five grandchildren: Devin, Dylan, Kyle, Raven and Alexis Johnson. She was preceded in death by her parents and her brother George “Butch” Clemans. The family will receive friends on Friday, November 23, 2018, from Noon - 2:00 P.M. in Deaton-Clemens Funeral Home, 115 S. Main St. Bourbon, Indiana 46504. Deaton Clemens Funeral Home is privileged to be entrusted in arranging the services. To send flowers or a remembrance gift to the family of Linda E. Holmes, please visit our Tribute Store. "Email Address" would like to share the life celebration of Linda E. Holmes. Click on the "link" to go to share a favorite memory or leave a condolence message for the family.